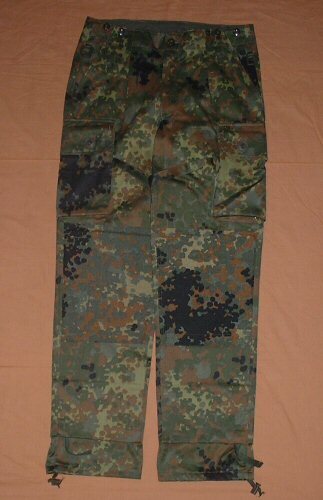 Genuine German army flecktarn trousers for special combat operatives, such as the German KSK. 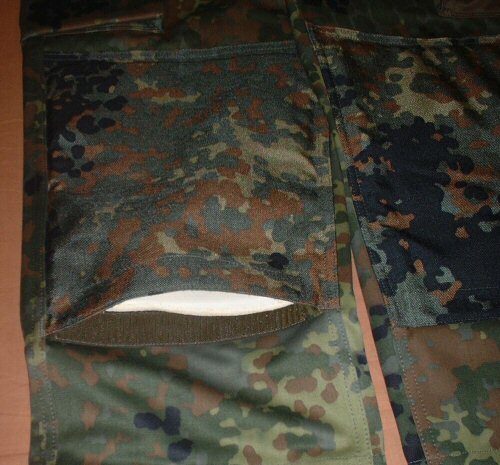 These top quality trousers are made by one of the major defence contractors for camouflage uniforms to the German military to exacting standards and have many improvements, developed with the help of special forces units, to enhance comfort in the field. 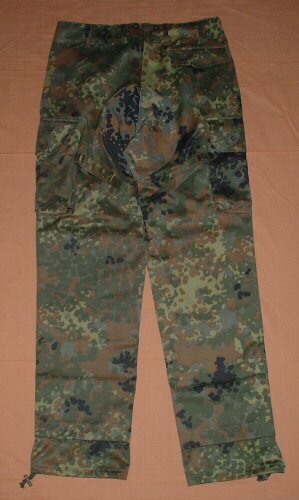 Material: 80% Cotton, 20% Polyester moleskin weave base with excellent rip prevention and stretch capabilities. 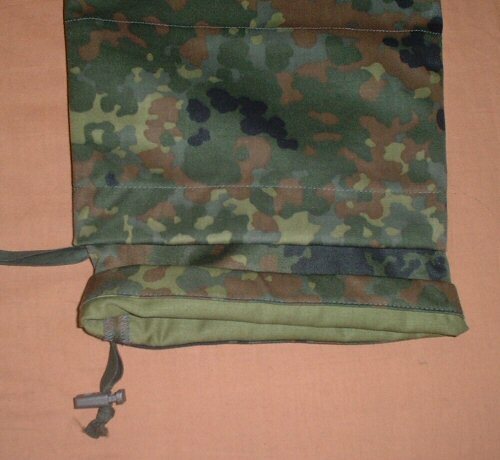 Knees and seat reinforced with a layer of 1000Denier military cordura as used in webbing gear. All materials are infrared resistant. Main Features: Two hip pockets; one button down rear pocket; and two large bulgy pockets, one on each leg. Each large bulgy pocket is buttoned down with two slotted buttons, and has a rivetted drain hole at the bottom to dispose of fine sand or water quickly on the move. The interior of the right bulgy pocket also has an extra thin pocket for holding a penknife, torch or similar tool separately from the rest of the contents of the pocket. Tough plastic d-rings are provided on the belt loop left and right for attachment of carabiners or small utilities. The knees open to allow insertion of padding (provided) for comfort. Ankle hem is provided with a drawstring, but also a secondary baffle on an elastic which helps to keep out insects and foreign matter. 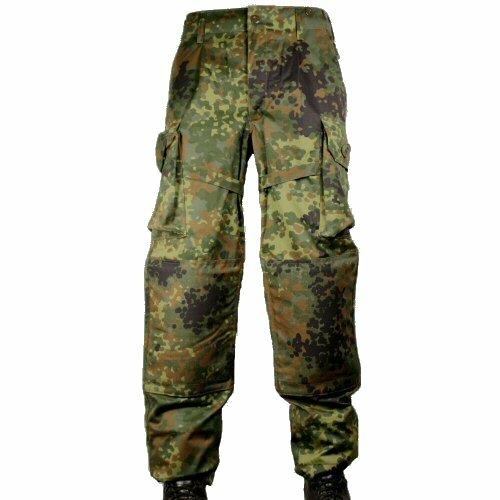 Fit and Wearability: Trousers are cut slightly wider and deeper than the standard German army combat trousers. Belt loops provided are 50mm in width to allow the wearing of a duty belt. Ventilation holes are provided in the crutch. Trousers close with button waist and zip fly. Adjustable compression straps around both thighs are integrated into the design and can be used to hold excess trouser fabric into the leg to minimise noise during movement. Sizes are S (31in, 80cm), M (33in, 85cm), M (35in, 90cm), L (37in, 95cm), L (39in, 100cm), XL (41in, 105cm). Available options are: S-31 , M-33 , M-35 , L-37 , L-39 , XL-41 , M , L , XL . Full frontal view of trousers. 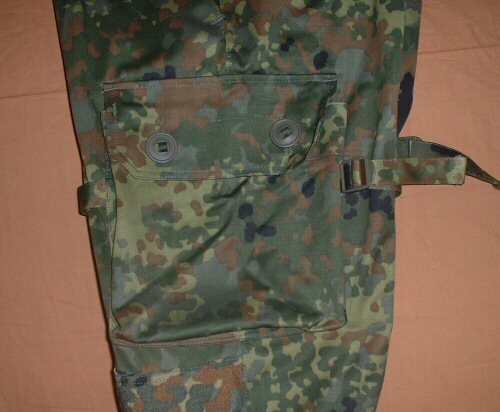 The cordura knees are clearly visible here, as are the extra length lower leg baffles for securing the bottom of the trousers to the boot and eliminating insect or draught ingress.